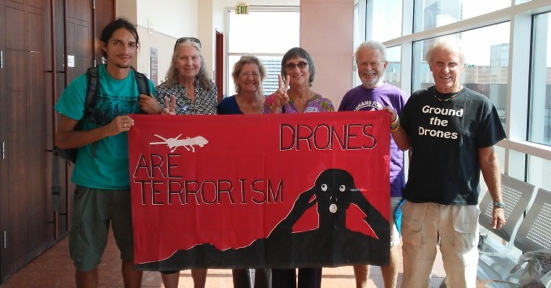 Went 2 the Bridge: Nevada Judge Frees Drone Protester, Thanks Her For "Passion And Commitment"
Nevada Judge Frees Drone Protester, Thanks Her For "Passion And Commitment"
I've been spending time on the Americans Who Tell The Truth website doing some research for a project. It's an excellent resource for educators and quite inspiring. Thus I was pleasantly surprised to open my email and find the following personal statement by a citizen who chose to stand up and tell the truth about drone warfare. Perhaps Robert Shetterly will paint Shirley Osgood's portrait one day? This is a write-up of what was to be my trial after being arrested on April 1, 2016 for trespassing on federal property at Creech Air Force Base, in protest of drone warfare. I arrived at the Las Vegas Airport on Wednesday afternoon, and was met by the amazing Catholic Worker, Robbie Majors, who drove me to my hotel where I continued obsessing over what I was going to do and say at my trial the next morning. Barry and Nancy, Occupy Beale AFB friends, arrived in the evening, and we had vegan dinner at Container Park. I went to bed hoping final inspiration would arrive in the night. Then Chris Nelson, another of my beautiful Occupy Beale AFB support friends, arrived at our room at 2AM after a late flight into Vegas, just to be support. The four of us met for an early breakfast, and in came Dennis Duval from Prescott, AZ. We all headed down Fremont Street, and arrived at the Justice Court in time for a rally at 8:15. We were met there by Robbie Majors with his sign, “No One Wins an Arms Race”. We held our anti-drone banners, and at about 8:45, Robert, a press guy from Channel 8, arrived to video and interview. We went up to the 8th floor and entered the courtroom, where a young woman with a Spanish/English interpreter was in process of getting a restraining order against a man. My wonderful support people sat with me and waited for my name to be called. When called, I stepped forward, and quickly became aware that Judge Ann Zimmerman did not have me down for a trial, but simply to clarify what I was going to do about getting an attorney, since I had signed to release Attorney Chris Grasso. I was not scheduled for a trial at all. I stated that I had flown in expecting a trial, and the Judge said it was her fault it was not scheduled. She sent me to a small room in the back of the courtroom with the public defender, who explained to me that the prosecutor was offering me a “submittal”. She explained that it did not involve making any plea. My choices would be a $250 fine, or 30 hours of community service. If I chose the community service, I would be on probation until its completion. Luckily, Chris and Dennis entered and were allowed to stay at my request. They offered me some good ideas, which resulted in my asking the PD if I could request dismissal, based on “time served”, which was one day in the Las Vegas Jail. She said she didn’t think that would be accepted, but she would ask. We all entered the courtroom, and the PD approached the bench with two men from the Prosecution. After a short chat, I was asked to come up, and was told that the Prosecution agreed to dismiss the charges with only the time served. There would be no fine, community service or probation. And I wasn’t even told that I had to “stay out of trouble”. I accepted, and asked if I could make a short statement. The Judge said yes, a couple of minutes. My statement started with a description of the young boy, Omran Daqneesh, whose home was bombed in Aleppo, Syria. He was shown being placed in an ambulance, alone. He was covered with dust and blood. (The Judge nodded and said, “Yes, I saw it”). I continued to describe how he touched his bleeding forehead, looked at the blood on his hand, and wiped the blood on the ambulance seat. I stated how hard it is to get this picture out of your head, and went on to say that I had other pictures, of drone victims, stuck in my head. I described the young child with the top of his head blown off, surrounded by flowers, and the dead mother whose limp arm was draped around her small young child. I went on to say that I was left with the choice of doing something, or doing nothing, and proceeded to describe a number of legal things that I had done to try to stop drone warfare. I talked about what was happening at Creech Air Force Base, and my reasons for doing direct action at Creech. "From Pakistan to Yemen to Gaza, drone warfare snuffs out the lives of innocent civilians with impunity and renders thousands more maimed psychologically, left homeless and without livelihoods. In the name of war on terror, drone warfare terrorizes entire populations and represents one of the greatest travesties of justice in our age." After listening to my statement, Judge Zimmerman thanked me for my passion and commitment, and I was free to go. We sang a round of “Circle Round for Freedom” on the steps of the courthouse before leaving, and celebrated on Fremont Street. Feeling grateful to be free and leaving Las Vegas. Hoping that this day may have some small impact on stopping the drones, and bring some peace to the world. Detail from the video below of the 2nd Annual "Shut down Creech protest"